*Carmelized udon noodles in a sweet soy sauce with broccoli, carrots and shiitake mushrooms. Asian sprouts, black sesame and cliantro garnish. *A rich and zesty tomato soup with a touch of cream, fresh basil and garlic. Topped with Italian parsley. About $7 with a drink! You can also sub out the soup for your choice of salad. 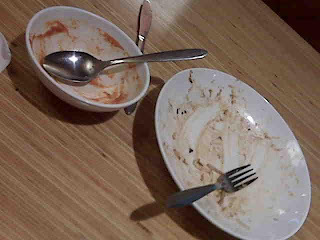 As you can see (by the empty plates) I devoured my food! The meal was delicious!